Adding another continent to my gluten-free travel series: how to eat GF in Marrakech, Morocco. If you haven’t been there yet, it’s definitely one to add to your list. Is there flour (or milk) in this? : Est-que il-y-a de la farine (ou du lait) dans ca? (ehst kuh ill-ee-ah de la fah-reen (ooh do lay) dahn sah? Carrefour has some (limited) gluten-free options, but be careful because the gf section is not exclusively gf — it contains products for other dietary restrictions as well. However it was the only grocery store we found in our short excursion outside of the Medina and it was definitely worth it. For breakfast and snacks, hit up one of the many (SO many) stands at Jemaa el-Fna (the main square in the Medina) for nuts and dried fruits. There are some fruits and veggies at markets, but be wary of those without peels. Make sure to rinse them thoroughly with bottled water. The tap water is apparently not safe to drink in the country, so don’t take any chances and always use bottled water and avoid ice (and not just for drinking — brush your teeth with bottled water as well). 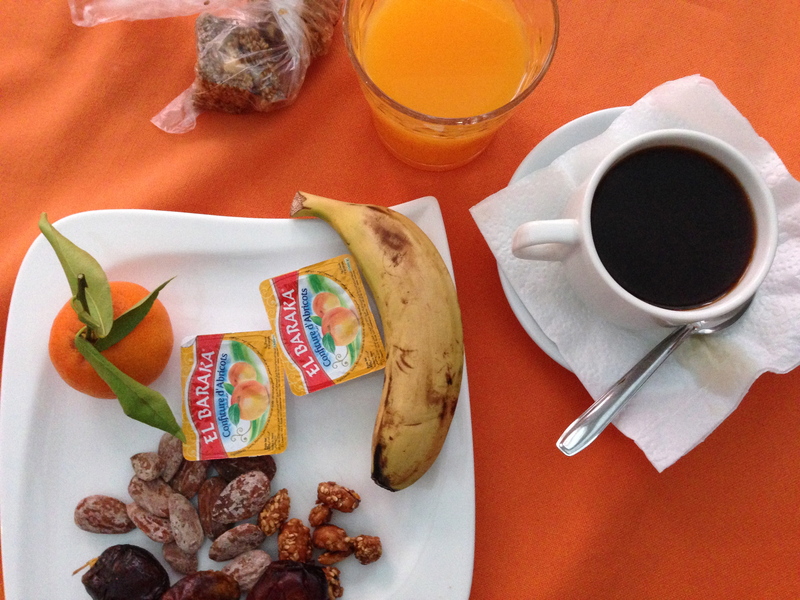 The obvious (and delicious) choices: traditional Moroccan mint tea, coffee, and orange juice. You’ll find these everywhere and you just really have to try each of them. Trust me. Restaurant El Bahia, next to Palais Bahia. It is absolutely gorgeous and the rooftop dining area is the perfect way to soak up your surroundings in peace. On a clear day, you can see out to the snowcapped Atlas Mountains! Each dish comes with an appetizer spread and a dessert – ours was orange slices sprinkled with cinnamon. Wow. Sit in one of the luxurious tents for shade or out in the sun if it isn’t too hot. 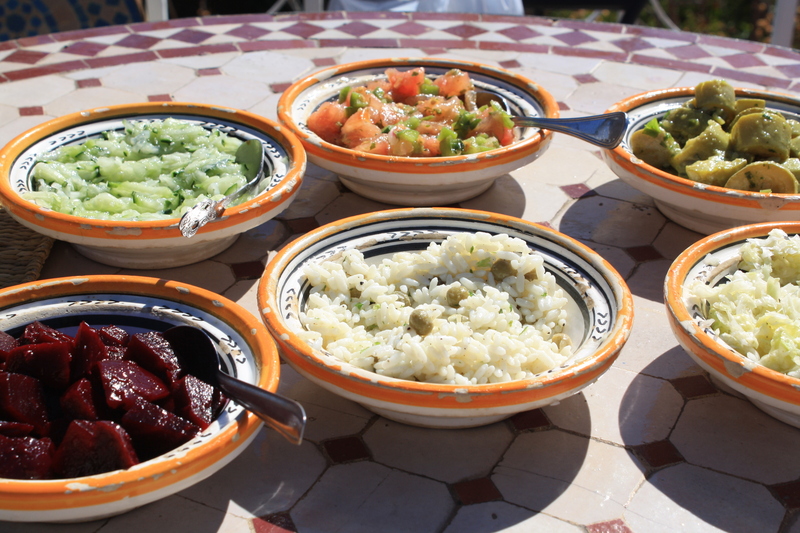 Kasbah Cafe: Some of the best olives I’ve had on a lovely rooftop. Great food & atmosphere. I highly recommend a meal here! For more on my travels to Marrakech, check out some video clips I put together here. And check out some of my other posts for more tips on travel with dietary restrictions and what to do if you get sick while traveling.